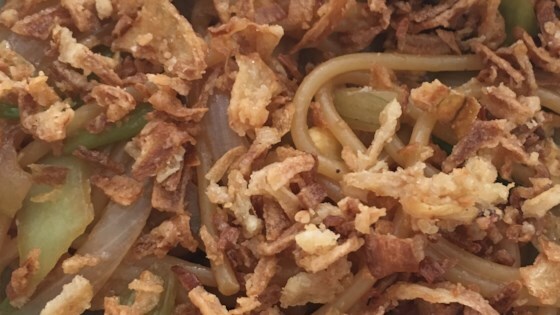 "This tasty noodle dish is the same one my mom used to make for me when I was growing up. It's definitely comfort food. You can alter it with adding your favorite meats and veggies." Bring a pan of water to a boil, and cook the ramen until tender, about 3 minutes. Plunge the noodles into cold water to stop the cooking, drain in a colander set in the sink, and drizzle the noodles with 1 tablespoon of vegetable oil. Set aside. Place the chicken strips in a bowl, and toss with olive oil, garlic salt, and black pepper. Heat 1 tablespoon of oil in a wok over high heat, and cook and stir the chicken until it is no longer pink, about 5 minutes. Stir in the shallots and garlic, and cook and stir until they start to turn brown. Add the cabbage, carrots, broccoli, and mushrooms, and cook and stir until the vegetables are tender, about 5 minutes. Stir in the ramen noodles, soy sauce, sweet soy sauce, and oyster sauce, mixing the noodles and sauces into the vegetables and chicken. Bring the mixture to a simmer, sprinkle with salt and pepper, and serve hot. Fantastic! I also used garlic powder in place of the garlic salt. Also doubled the cabbage & used a bag of stir-fry veggies. We all loved it!